If the politicians had been removed from the process immediately after the June 2016 referendum, Brexit would have been all too easy. Great Britain would have been free from the chains of the European Union bureaucracy for a whole nine months enjoying the prosperity that self-government and free enterprise always bring. Instead the politicians took control of the process and put their own globalist agenda before the will of people leaving Great Britain humiliated on the world stage and still locked into the EU institutions almost three years after the people voted to leave. If the politicians were serious about fulfilling their promise to implement the result of the referendum they could have repealed the 1972 European Communities Act immediately and just walked away leaving the door open for a trade deal or they could have triggered the Article 50 leaving process on the 24th June 2016 utilizing the two year leaving period for both sides to prepare for World Trade Organization (WTO) rules. Bearing in mind that the bankrupt Eurozone is dependent on the British market to survive, it would be in the interests of the EU to beg for a bespoke trade deal. They could have tabled their requirements and the British side could have accepted it or not depending on its value to the British people and their economy. 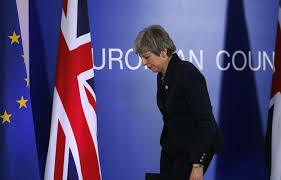 Any experienced negotiating team not involving politicians would have used this leverage to their advantage, but it was not utilized by the British government because they are dedicated Europhiles who do not want to leave or put their beloved European Union at a competitive disadvantage. Years of experience have taught previous governments and political observers that the European Union is a political project with a fixed agenda and timetable, therefore it does not negotiate or compromise. By engaging in a prolonged and complex negotiation before Brexit can only mean that Prime Minister Theresa May and the British government had no intention of honoring the result of the referendum and leaving the EU. After almost three years of negotiating the British people are still locked inside the corrupt and failing Union remaining subject to its regulations, diktats and justice system while still forking out 12 billion pounds per year for the privilege. After the latest humiliation at the hands of the EU bureaucrats and with no solution in sight, Mrs. May and the swamp dwellers in Parliament have ramped up Project Fear painting a picture of chaos and economic Armageddon should Great Britain leave as the law demands without a deal. Ignoring the fact that eighty percent of world trade is outside the EU and conducted using WTO rules Great Britain would prosper and thrive once freed from the restrictive shackles of the Brussels bureaucrats. Political charlatans and their bought-and-paid-for media propagandists have been referring to leaving under WTO rules as ‘crashing out’ and ‘driving off a cliff edge’ that will put businesses and jobs at risk. Adding to this campaign of fear mongering, Mrs. May has declared that Great Britain is now in a full-blown crisis. Absolute nonsense! British businesses, supply chains, transport companies, ports, airports and everything else outside the bubble have confirmed that they are ready for any contingency that may happen should Great Britain leave under WTO rules. The WTO itself have indicated that they do not foresee any problems should this scenario occur. The real world outside the incestuous world of Parliament and the establishment is calm and ready to deal with life free from the shackles of the malevolent Brussels bureaucracy. To the spineless politicians of Westminster, I say, Oh Ye Of Little Faith! Great Britain is the fifth largest economy on the planet which is growing while the Eurozone is failing and bankrupt. We are a nuclear power with a seat on the UN Security Council; we were instrumental in defeating the Kaiser, Hitler and communism. If you think we cannot handle leaving an autocratic, corrupt and failing political entity you should resign and make way for a leader who shows courage and fortitude and who embodies the spirit of the British Bulldog not a simpering whelp crying for its mummy. The REAL question is whether the UK "Law Enforcement" will stand with the people, or will instead continue to do WHATEVER they are told, as long as that paycheck keeps comin' in. Seeing what they did to murder Charlie Gard and murder Alfie Evans, I know how THAT will work. Time for One Shot Paddy in Great Britain, dealing justice to UK "Law Enforcement" and their families. In their homes. It will depend on the individual cop, not all of them are unprincipled agents of the state. I don't know there will be an appetite for One Shot Paddy bearing in mind the history of these islands and especially for harming families.